Here's hope and help for food addicts. Developed by Janet Greeson, a nationally renowned pioneer in the development of addiction treatment programs, this day-by-day self-help program treats the physical, emotional and spiritual causes of food addiction. Recognize why you overeat - get in touch with your past and handle the feelings that trigger your eating problems Use psychological techniques to banish depression and build self-esteem Discover defense mechanisms that prevent you from confronting your problems Break the dieting and binge-purge cycles - and eat normally at last! 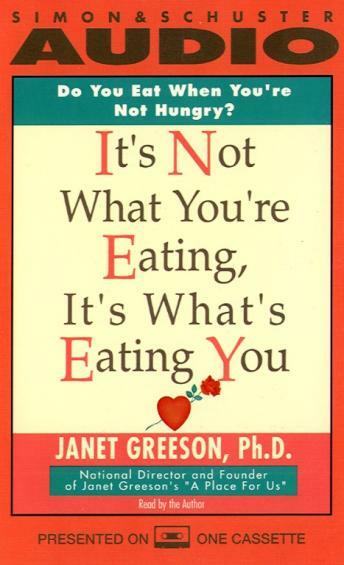 Providing significant information on food, nutrition, exercise, and stress management, It's Not What You're Eating, It's What's Eating You is an essential audio program for anyone who wants to choose a new life - free of food addiction and depression.